Delivering performance in food supply chains: An introduction. Part 1 Managing relationships in the food supply chain: Performance measurement in the management of food supply chain relationships; Living with power imbalance in the food supply chain; Supplier safety assessment in the food supply chain and the role of standards; Understanding innovation in food supply chains. Part 2 Aligning supply and demand in food supply chains: Sales and operations planning for the food supply chain: Case study; Food supply chain planning, auditing and performance analysis; Aligning marketing and sourcing strategies for competitive advantage in the food industry. Part 3 Managing processes efficiently and effectively in the food supply chain: Value chain analysis of the UK food sector; Improving responsiveness in food supply chains; Reducing product losses across the food supply chain; Methods for assessing time and cost in a food supply chain; Improving food distribution performance through integration and collaboration in the supply chain. Part 4 Maintaining quality and safety in food supply chains: Enhancing consumer confidence in food supply chains; Quality and safety standards in food supply chains; Developments in quality management systems for food production chains. Part 5 Using technology effectively in food supply chains: Role of diagnostic packaging in food supply chain management; Advances in the cold chain to improve food safety, food quality and the food supply chain; Simulation modelling for food supply chain redesign; The adoption of e-business solutions in food supply chains; Radio frequency identification (RFID) as a catalyst for improvements in food supply chain operations. Part 6 Delivering food sustainably and responsibly: Reducing the external costs of food distribution in the United Kingdom; Fair trade and beyond: Voluntary standards and sustainable food supply chains; Trends in food supply chain management. Food and drink supply chains are complex, continually changing systems, involving many participants. They present stakeholders across the food and drinks industries with considerable challenges. Delivering performance in food supply chains offers expert perspectives to help practitioners and academics to improve their supply chain operations. The Editors have identified six key challenges in managing food and drinks supply chains. Each section of the book focuses on one of these important issues. The first chapters consider the fundamental role of relationship management in supply chains. The next section discusses another significant issue: aligning supply and demand. Part three considers five different approaches to effective and efficient process management, while quality and safety management, an issue food companies need to take very seriously, is subject of the next section. Parts five and six review issues which are currently driving change in food supply chains: the effective use of new technologies and the desire to deliver food sustainably and responsibly. 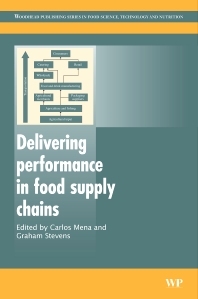 With expert contributions from leaders in their fields, Delivering performance in food supply chains will help practitioners and academics to understand different approaches in supply chain management, explore alternative methods and develop more effective systems. Carlos Mena is a Senior Research Fellow at the Centre for Logistics and Supply Chain Management, Cranfield University School of Management, UK. Graham Stevens is Managing Partner of GCS Consulting and a Visiting Fellow in Logistics in the same school.